CONCERTO is a new stereo interconnect cable designed to achieve high sound quality by using the latest Black Rhodium high end cable technology. CONCERTO is hand built at the Black Rhodium factory in Derby by employing advanced design techniques developed by Black Rhodium for use in its most expensive products.  Rhodium Plated GN Legacy Plugs With ‘Straight Line Contact’ Plugs. CONCERTO has been designed to apply the musical benefits of the GN LEGACY VS-4 Vibration Stabiliser to reduce vibration distortion. The vibration stabiliser has been specially designed to reduce audible cable distortion in cables by limiting the effects of vibrations travelling through the conductor wires which can cause audible distortion to your music. Application of complementary absorbent materials further reduces distortion Low Loss Silicone Rubber Insulation Reduces Time Smeared Distortion. The wires in CONCERTO are insulated in silicone rubber because its low dielectric loss ensures extremely low distortion due to dielectric absorption effects in which sound energy is absorbed in the insulation and released at a later interval of time to create highly audible time-smearing distortion. CONCERTO is terminated with ultra-high quality Rhodium Plated plugs. The RCA version is terminated with specially designed GRAHAM NALTY LEGACY RANGE GN-4 RCA connectors. These have been specially manufactured to ensure that Black Rhodium cables deliver the very best sound quality possible. The XLR connectors are the new Black Rhodium XLR connectors designed especially for use in Black Rhodium cables. Rhodium plating is applied to the plugs to ensure a cleaner and less corroded contact is maintained between the plug and socket. The benefit of rhodium plating over gold plating is a much livelier and more exciting sound from the music. Ultra Low Transient Phase Distortion through Innovative Design. CONCERTO gives a very clear diction of a singer’s voice and separates musical instruments superbly through a dramatic reduction of ‘Transient Phase Distortion’. ‘Transient Phase Distortion’ is reduced by using thicker insulation than is usual in speaker cables, increasing the distance between conductors and thereby reducing the magnetic field seen in each conductor wire as a result of the magnetic field created by the current in the other conductor wire. A further increase in the distance between conductors is achieved by use of the attractive cable braid and this further reduces ‘Proximity Effect’ distortion. By very substantially reducing this form of distortion, the music becomes clearer and more dynamic, with greater ambience and experience of the music’s emotional qualities. 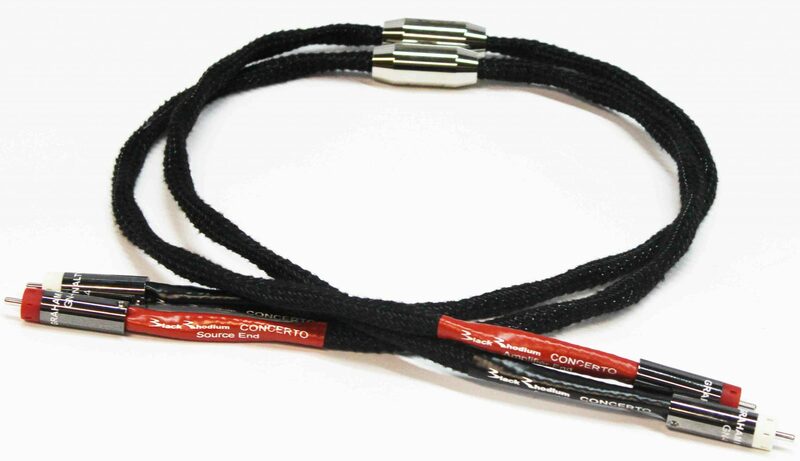 Construction of CONCERTO includes the use of two separate and complementary materials that effectively damp Mechanical Vibrations within the cable over and above the expense of Vibration Stabilisers. Anti RFI / EMI Technology to Further Reduce Distortion. CONCERTO is covered in a tightly braided screen to protect the inner cores from picking up radio frequency interference (RFI) generated from Radio, Wifi, Mobile Phones and even central heating systems. This reduces the amount of audible distortion in the cable, allowing cleaner, clearer sounds to be enjoyed from your equipment.